The air no longer yields a warming touch over my skin, instead I awake to a dark dawn filled with chill–and I’m okay with it. It’s an invitation to shed my worries and fears, surrendering to the harvest time of fall. It sends my babes and I inside as fall surrenders to winter, this season will be where my family and I will gather often around the table for warmth, love, and nourishment of their bodies and souls in the midst of biting cold. 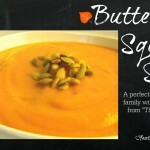 This brings me to one of our favorite fall recipes, Butternut Squash Soup topped with Pepita Seeds. OH SO GOOD. Sweet, rich, full of warmth with a nutty flavor. Serve it with thick warm crusty bread for family dinners or serve it as part of your Thanksgiving meal!! To make it healthy like we do, consider using organic ingredients or items fresh from your garden. Tip: Consider creating a double or triple batch, once the soup cools, poor into freezer containers and freeze. On serving day, de-thaw soup, and heat to simmering, adjust seasonings as needed. 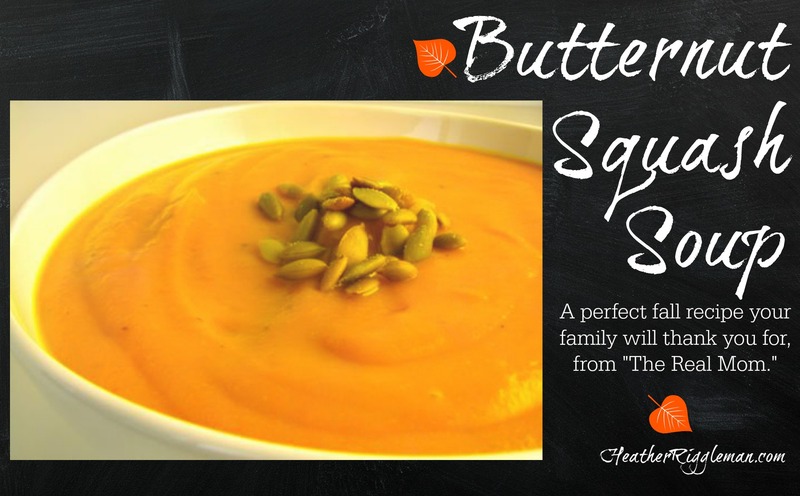 This bright and warm soup is perfect for family get togethers or as part of Thanksgiving. In a large stock pot over medium heat, heat the olive oil and saute the garlic, onions and celery, stirring often, until soft and fragrant, about 5 minutes. Add the carrots, apple, butternut squash and vegetable stock. Bring to a boil, then reduce the heat to low and simmer until all of the vegetables are tender, about 30-40 minutes. Working in batches, transfer the soup to a blender and process until smooth. Return the soup to the pot. Stir in the milk, salt and pepper, and cook until desired temperature and consistency, adding more milk as desired. Serve hot and top with a handful of roasted pepita seeds.